90 min. MGM. Director: Frank Oz. Cast: Matthew MacFadyen, Peter Dinklage, Ewen Bremner, Rupert Graves, Alan Tudyk. Frank Oz's latest film—the British-based comedy of embarrassment Death at a Funeral—proves you can spell funeral without "fun." Certainly, Oz has the comedy chops, and he has a number of proven perfomers flop-sweating through key roles, so there's no doubt about it: the undercooked script deserves the brunt of the blame. When it comes to farce, "watchable" just isn't good enough. Clunky exposition establishes all the stock characters you'd expect from a dysfunctional family clan—principally a fusty good son (Matthew Macfadyen) tired of living in the shadow of his gadabout brother (Rupert Graves). At their father's funeral, a mysterious guest (Peter Dinklage) reveals a game-changing secret about dear old dad, and the fiancé (Alan Tudyk) of the boys' cousin (Daisy Donovan) causes havoc after accidentally ingesting a hallucinogen. 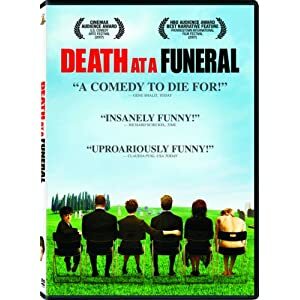 Hijinks predictably ensue, but since the characters are uniformly unpleasant (and hardly any more credible in their actions and reactions), and Dean Craig's script is notably lacking in laugh lines, most of Death at a Funeral isn't terribly funny. Matters improve when the farce belatedly kicks in, but the film's sole comedic kicker is shamefully spoiled in the trailer. Venal characters aren't a dealbreaker if one commits to following where they lead, but Craig too often pulls his punches, or swan-dives to a low joke (poo on the hand, anyone?) instead of getting his own hands dirty. As for the cast, Macfadyen's too bland and sodden to be the eye of a farcical storm, Graves betrays little knack for comedy, Dinklage is wasted, and Peter Vaughan is thoroughly embarrased as old Uncle Alfie. Alan Tudyk (soon to be seen in 3:10 to Yuma) fares best: being stoned and naked for most of a picture is obviously liberating. It also looks like quite a bit more fun than watching Death at a Funeral. MGM's Blu-ray debut of Death at a Funeral features solid A/V specs and bonus features, in a special edition that pleases but may only justify a double dip for die-hard fans. Picture quality is excellent, with good detail and accurate color that's richer than you'd find in standard def (though the palette is purposely dull most of the time); contrast is quite good, with a pleasingly deep black level. The DTS-HD Master Audio 5.1 isn't as well-balanced as it might be in its prioritization of dialogue, but I'm sure most won't gripe with it: it's a clean mix. Returning from the DVD are commentary with director Frank Oz; commentary with writer Dean Craig and actors Alan Tudyk and Andy Nyman; the film's “Gag Reel” (7:46, SD) and “Theatrical Trailer” (2:19, HD). All site content © 2000-2019 Peter Canavese. Page generated at 04/25/2019 10:16:41PM.